Where Can I Order a Pop Up Stand? Pop up exhibition stands are the bread and butter of exhibition and event displays. They have long been the go-to marketing solution because of their high-impact yet cost-effective features. Their popularity has resulted in the market becoming saturated with pop up stand suppliers. The overwhelming choice can seem daunting at first, and it can be hard to know which company will provide you with the best stand that is fit for purpose. Like with anything, there are key markers to look out for when choosing a supplier. Here at XL Displays, we pride ourselves on our outstanding customer service and product quality, so much so that we focus a lot of our attention on obtaining reviews. We have almost 10,000 Trustpilot reviews that are visible to everyone on the internet. This kind of exposure enables potential customers to read what previous clients have said, their experiences with our company and whether or not they would recommend our services. All of this information allows people to decide whether or not our service sounds reputable and if we would be a good candidate for them to come to when choosing a pop up stand. We have over 20 years of experience in the exhibition and events industry, and XL Displays was built on the foundation of pop up display stands. Pop up stands were one of the first products we ever started to manufacture and our business thrived off of their success. We are currently the industry leaders in pop up exhibition stands and produce hundreds each month. We have one of the most comprehensive product ranges in the UK and use only the best quality materials. We are able to identify and source the best materials as a result of our decades of experience, allowing us to provide our customers with nothing less than the perfect pop up exhibition stand every time. Will They Listen To My Needs? In the world of business, everything centres on money and making a profit. Lots of exhibition stand suppliers use this as an opportunity to sell customers the most expensive solution that is not always fit for purpose. Here at XL Displays, our sales team undergo weekly product training on all of our product ranges to ensure that they are completely up to date and knowledgeable on each product that we supply. This allows them to listen to a customer and suggest the best solution based on the client’s needs by cross-referencing their requirements with the knowledge they have on each product. This means that a lot of the time the most expensive option isn’t the one we sell, but we would rather provide our customers with the best solution that is fit for purpose rather than take their money in return for a product that simply won’t work for their brand or their marketing needs. Will I Have Options To Choose From? Sometimes, it can feel like you’re cornered into buying something because there isn’t another option. Everyone likes to have options, especially when they are making a large investment in a product such as a pop up display stand. At XL Displays, we have adapted and developed our pop up exhibition stand range so that there is a solution for every brand, every space and every budget. We supply everything from linked pop up stands, curved pop up stands and straight pop up displays to jumbo pop up exhibition stands and midi pop up display stands. 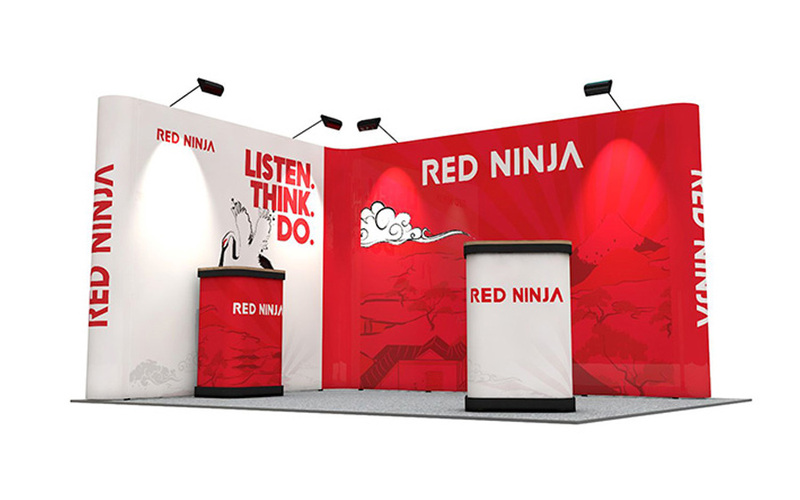 Our 3x3 curved pop up stand is our bestselling pop up display because of its versatility and value for money. The 3x3 curve is part of our standard pop up display range which comes with everything you need at your exhibition. This includes the pop up stand and graphics, a Zeus2 transport case with a graphic wrap and beech top, and a set of LED lights to illuminate your display in a high impact but cost-effective way. If you require something of a similar size but don’t want it to be curved, there are other options. 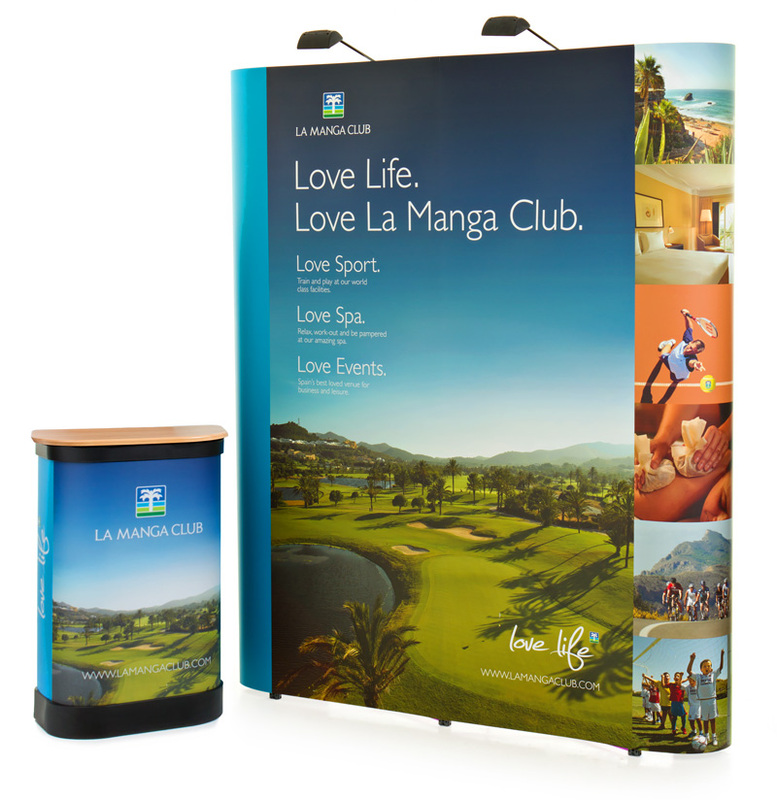 Straight pop up displays work superbly as flat backdrops at a wide range of events, whilst a smaller linked pop up stand fits neatly into the corner of a shell scheme booth whilst taking up a similar amount of space. We have previously written in depth about pop up exhibition stands and all of the different solutions. Read our previous article titled ‘How to Choose the Best Pop Up Stand’ to find out more about our full range and to give you a little bit of guidance on which one may be best for your brand. Nobody wants to spend their hard earned money on a low-quality product that will break after one use. Equally, no one wants to receive a product that looks nothing like what they expected. We treat every product as if it were our own. This means we rigorously check each pop up display stand at every stage of production. We offer a free artwork checking service for companies who already have their artwork sorted. We designed our free checking service to minimise the chance of poorly printed graphics. When checking artwork, our graphic designers will ensure it is of the highest resolution and fully compatible with the printers so that the graphics come out looking as vibrant and sharp as possible. We would never print anything that is pixelated, dull or inadequate because we know that your business deserves better than that. After the artwork has been checked and signed off by both the graphics team and the customer, we then send it to print where it is once again inspected as it comes off the printer to ensure there are no inconsistencies within the print. It is then checked again during lamination, before being checked a final time during the test-build process. The production manager then signs it off and sends it out for delivery. This process may seem long, but it allows us to make sure that what the customer receives is of the highest quality. Once you have asked yourself the above questions and got your answers, you should be able to make a more informed buying decision about who you go to for your pop up stand. Here at XL Displays, we pride ourselves on our quality and our attention to detail. These are attributes which have earned us the reputation we have today as the industry leaders in exhibition and event solutions. We built our business on the foundation of pop up exhibition stands and have grown and adapted to ensure that the quality is 100% perfect time and again. We would love to speak to you about your pop up exhibition stand needs and help you come up with a suitable solution that is ideal for your budget – whatever that may be. Get in touch with our dedicated sales team today on 01733 511030.